Wireless technology has a habit of only working above water. This poses a problem when deploying deep sea monitoring equipment. Current methods use large amounts of cables to network everything together, a process that is expensive and time consuming. 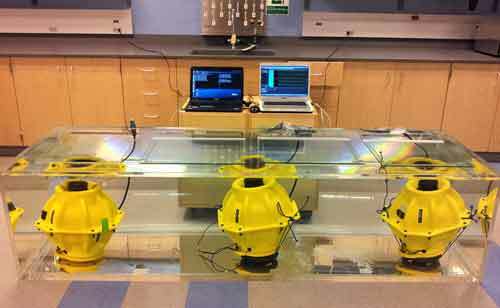 Researchers in the University at Buffalo have begun floating wireless modems that are designed to work under water. The main challenge faced here is the fact that radio waves don’t travel very far in aquatic environments. To overcome the issue, wireless signals have to be broadcast over an acoustic network. In other words, the modems beep and chirp to send information. Unfortunately, this information is audible to both humans and animals; preventing it from being used due to environmental concerns. The acoustic signal is also terribly slow, which forced the researchers to rewrite the TCP/IP connection to deal with the slower speed. Current data speeds are similar to that of modems from the 80s. It’s still a long way to go, but the University hopes that this will make it easier to deploy aquatic monitoring devices in the future.